Portsmouth was home to several establishments for the children of seafarers. In 1825, a school was established in Bath Square, Portsmouth, known as the Seamen and Marines' Children's Schools. A branch of the Seamen, Marines, and Fishermen's School was opened in Ordnance Row in 1836. The most prominent of these institutions, however, was the Portsmouth Seamen and Marines' Orphan Schools, founded in St George's Square, Portsea, in October, 1834, with 27 children. Ten years later there were 312 scholars. The Schools purchased new premises in 1850 at the Queen's Rooms, Lion Terrace, which were formally opened on January 25th, 1851. Two years later, a Home was opened to provide some of the girls with 'industrial education' — training to prepare them for domestic service. In 1855, the Home started taking girls supported by the Royal Patriotic Fund, a national charity established during the Crimean War to assist the widows and orphans of soldiers and sailors. In the same year, reflecting its evolution from a local to a national institution, the Portsmouth establishment was renamed the Royal Seamen and Marines' Orphan Schools and Female Orphan Home. It now provided for the boarding and education of sixty girls and the daily education of sixty boys. The foundation stone for a new building at St Michael's Road, Landport, was laid by the Duke of Edinburgh on April 20th, 1874. At that date, only £3,000 of the required £7,000 had been raised. Fund-raising continued and, exactly two years later, the Duke of Edinburgh opened the new premises which could accommodate 200 girls as boarders and 100 boys as day scholars. The St Michael's Road site is shown on the 1898 map below. Royal Seamen and Marines' School and Female Orphan Home site, Portsmouth, c.1898. In 1880, it was reported that the institution now clothed, boarded, and instructed 137 orphan girls, and sixty fatherless boys were instructed, clothed, and were given a breakfast and dinner daily. The girls remained under instruction until fit for domestic service, and the boys until situations were found for them, or until they obtained admission to the Greenwich Hospital School. However, many of the orphans of seamen and marines remained on the Greenwich School's waiting list for months or even years, or were rejected altogether due to lack of accommodation in the home, or funds for their support and education. The St Michael's Road building was extended by adding a new wing to receive fifty additional girls. When completely furnished, the cost of the extra accommodation was around £3,000. Following the passing of the 1894 Education Act, the boys' day school no longer received a government grant and so was closed, Some of the boys were then received at the Swanley Home for Boys in Kent, with the Portsmouth home then becoming a girls-only establishment. The girls at the home received basic classroom education and also instruction in domestic occupations such as sewing and dressmaking, cooking, bed making, laundry work and floor-scrubbing. Browse through a gallery of pictures of the home in around 1908. In 1918, and infants' department was established at Clarendon Road, Southsea. It accommodated 20 children aged from 4 to 7 years. The cost of the property's purchase and furnishing was met the Canadian Government, in recognition of which the Home was named 'Canada'. 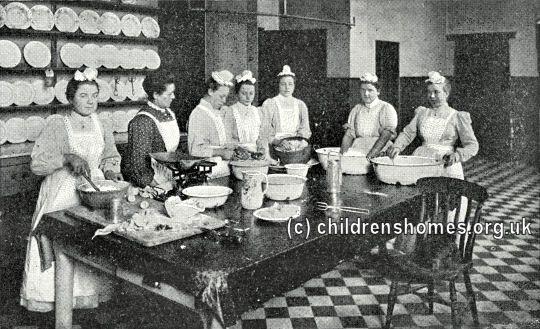 From 1920, the girls in the Home attended council schools in Portsmouth, while the younger children in the Southsea branch were sent to St Jude's Day School. The home was later renamed the Royal Naval and Royal Marine Children's Home. After the Second World War, it moved to new premises at South Africa Lodge, 43 Stakes Hill Road, Waterlooville. It is believed to have finally closed in around 1969. Royal Navy and Royal Marines Children's Fund now continues the activities of the charity in other directions. 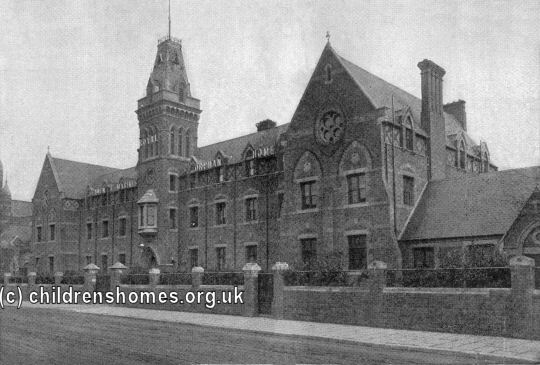 In the 1950s, the St Michael's Road building was used as a War Department Hostel but was demolished in the 1960s. South Africa Lodge is now occupied by a nursing home.